Yesterday, our neighbour-on-the-left (Nol for future reference), had her lawyer turn up on our property with the police in tow. The lawyer arrived bearing notice of an Urgent Interdict to be heard in court this morning, while the police threatened to arrest Nigel, our site manager, and to take him off to jail right there and then. (Quite what influence this lawyer has on the police is something of a mystery. It’s not as if a charge has ever been laid against Nigel and I’m not sure if they had an actual warrant on them or not. It’s fascinating. It can be difficult to get the police out even in an emergency so to have them come out on a spurious charge of trespassing – which he was not doing – must take some persuasion.) Although I know I have mentioned problems with Nol in earlier posts, I have tried to stay away from the topic as much as possible on this blog. That is not to say there haven’t been ongoing niggles and complaints along the way. There have. Many of them. But for the most part I have continued to believe that a calm, measured and co-operative response would win through in the end. It has in the past, in all other aspects of our lives. But it’s not working this time. My first draft of this post, written last night, ran into pages and pages as I tried to document all the stages and correspondence that led up to yesterday’s denouement but it became a cumbersome – and boring – piece of writing. Suffice it to say that from inception this neighbour has been difficult about the boundary wall separating her property from ours. It’s a horrible wall, made up of different sections of brickwork and precast panels. It wanders down the slope weaving from her side of the boundary to ours and parts of it, being pushed over by trees towards our side, look as though they could collapse at any minute. 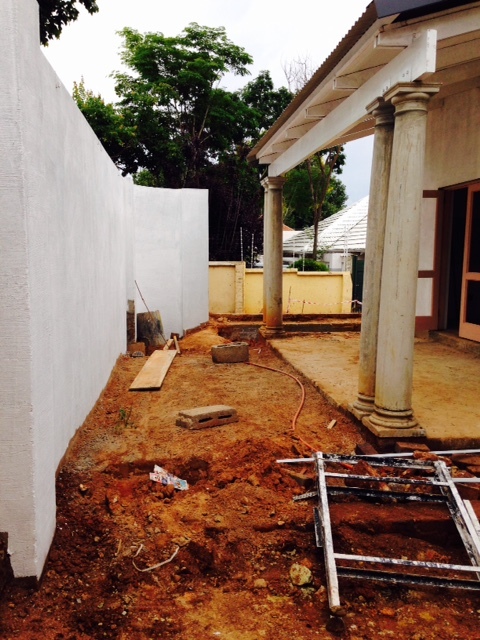 Way back, we offered to build a completely new wall, entirely at our cost, down the full length of the property following the correct building line. It would have been plastered on both sides and topped with electric fencing – she has huge security concerns – and she could have painted her side any colour she liked. This was rejected out of hand. Then there was a period in the middle of the year when it seemed it might be allowed, but when the reality dawned that the shabby precast wall would have to come down and that some of the privet and syringa trees (both regarded as alien invaders in this country) would have to go or be drastically trimmed, there was another Nol wobble. With the Builders’ Holidays being almost upon us, it has become more urgent to resolve the issue, especially with regard to the precast walling. All attempts to communicate have been rebuffed and we’ve been told to talk only to her lawyer. This has been a very new experience for us, not being litigious by nature. Attempts to contact the lawyer last week were unsuccessful and eventually, with another deadline passed, work on dismantling the precast wall started yesterday. It is worth mentioning that this stretch of wall is entirely on our property and topped by electric fencing installed by us in an effort to placate our neighbour’s security fears when we first started building. So ‘trespassing’ doesn’t come into the picture. Presented with notice of an interdict yesterday and the threat of Nigel being carted off to jail, we’ve had to concede the defeat of any rational, co-operative approach. So we’ve been forced to get a lawyer of our own to intervene on our behalf. For now, the ‘Urgent Interdict’ is on hold and an offer has been made by us to provide for extra security for the duration of the reconstruction. It’s funny. If I ever felt threatened of overwhelmed by building activity next door, I would regard my security as my responsibility and would install whatever extra measures I felt were necessary. It has never occurred to me for a second that my neighbours are in any way obliged to take my safety – or my anxieties – into account. This whole experience has been something of an eye-opener to us, but actually, knowing that in future we’ll also be able to say ‘Talk to Our Lawyer’ is quite a relief. 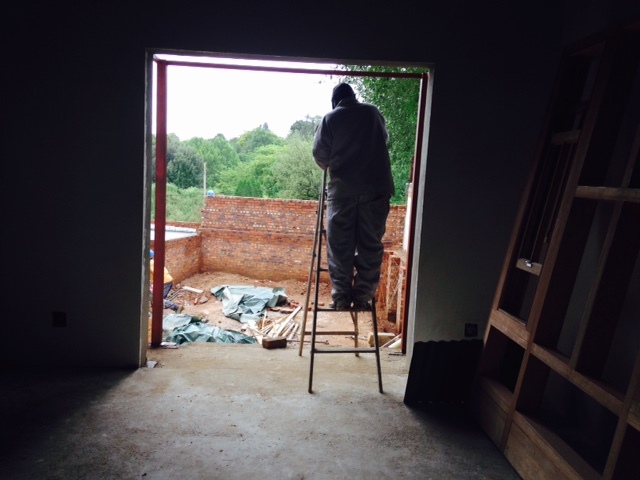 By this stage, we’ve heard just about every other possible excuse for what seems to be one of the slowest building projects ever and my response to the ‘weather’ one is to discount it as there is an endless list of things to be done inside out of the way of rain and lightning. We are, however, now on a helter-skelter slide to the South African Builders’ Holidays which start next Friday the 12th and which continue until the 12th of January. We resigned ourselves months ago to not being in the new house before Xmas and are concentrating now on simply getting it to as secure a condition as possible before everyone disappears to The Bush, The Coast, or, as with most of the labourers, to other parts of the African continent. The contractor is making a big deal out of security. Personally, I think he is exaggerating the risks but then he does have experience in these things so I’m trying not to say too much. I rather suspect that his reluctance to have the plumbing completed before the 12th of December has more to do with simply running out of time than of the risk that the copper piping might be ripped from the walls in the dead of night over the Xmas holidays… Once again, for those of you in First World Countries, this might seem unlikely, but the theft of copper piping has become quite a major issue here. My husband has turned into quite an impressive project manager over the past two months and along with Bernard is drawing up weekly schedules for the site manager to follow. We never expected to have to get so involved in micro-managing things but it seems to be working. Fred, over there in Sydney, we do rather wish you were here to take this on! In an effort to convince myself that we have made some progress during the year, I looked back over this blog to find what things looked like last December and found the photo below on a post written on December 2nd, 2013. Well, we’ve come quite a long way since then but so we should have seeing as it is a full year tomorrow since this photograph was taken and it’s not as though we’re building a particularly big or complicated house. But, looking on the positive side of things, although very slow, Bernard is very happy with the quality of the workmanship so far. So, for the sake of reassurance, the photo below, taken from an upstairs window of the cottage, shows what things looked like yesterday. South view of house. Taken from upstairs cottage window. So by the end of next week, all the exterior doors must be in and locked and all the windows must be glazed. The opening onto the park must be secured and the gates onto the street must be bolted and that’s about all we can hope for at this stage. These doors are waiting to be installed across the front of the veranda. They’ll hopefully make it a completely weatherproof space in both winter and summer. View across stairwell from the pyjama lounge. Finishing off rhinoliting in the stairwell requires a head for heights. 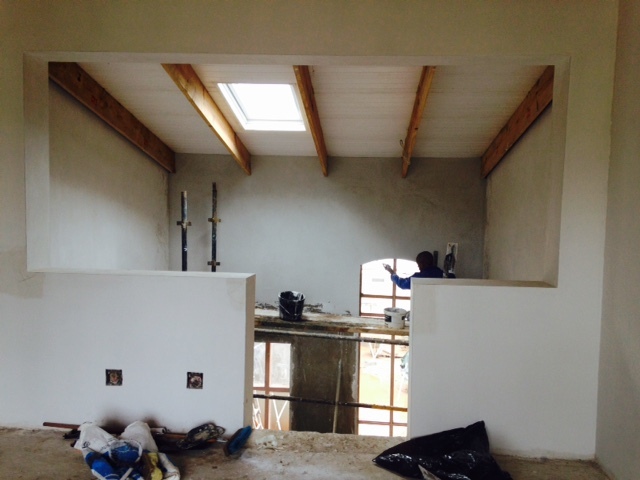 For those of you overseas who might have another term for rhinoliting, it is the art of applying a 3mm plaster finish to walls and ceilings using gypsum plaster, especially manufactured as a combined basecoat and finishing plaster for internal application onto brickwork. It gives an exceptionally smooth finish and there is a certain degree of skill required to apply it. 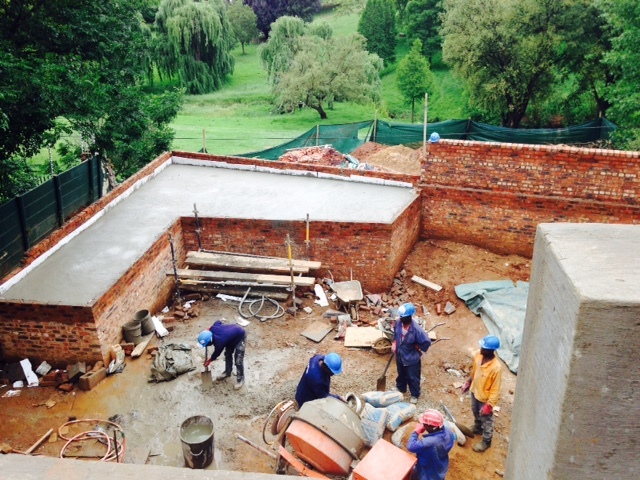 Throwing concrete slab on ‘underground’ room. 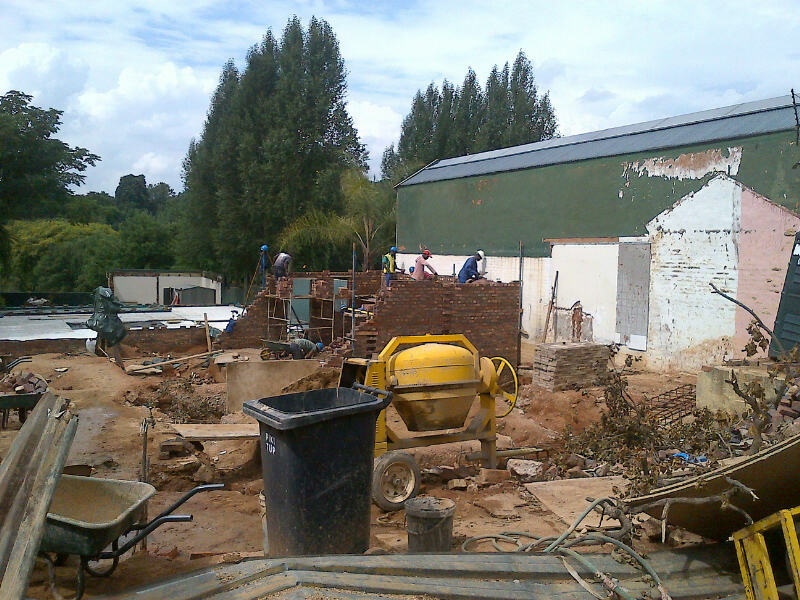 On Friday the workmen were busy throwing the slab on the ‘underground’ room (L-shaped structure on the left of the photo) that is to house the pool pump, water tanks and generator. With the number of power cuts we’re experiencing at the moment, we’re looking forward to having an alternative power supply. Framework for Bay Window going in at last. 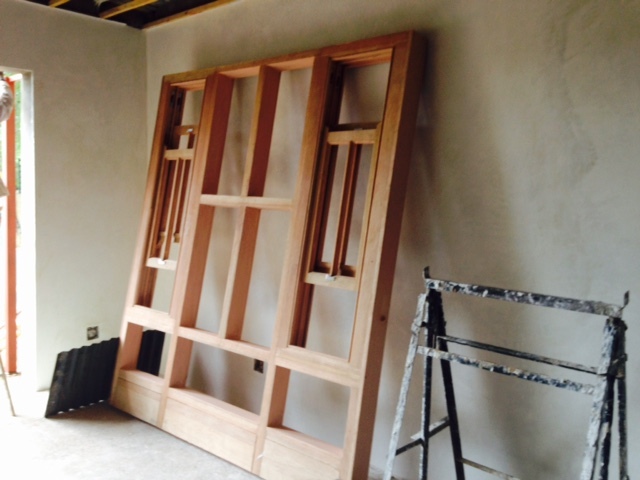 Part of Bay Window Frame waiting to be installed. We’re putting pressure on the contractor to get the cottage finished by mid-February. 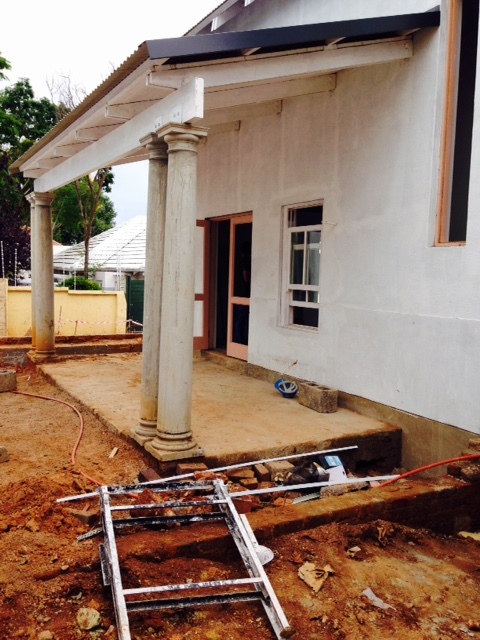 The ground has been filled in to the right level for the cottage carport. 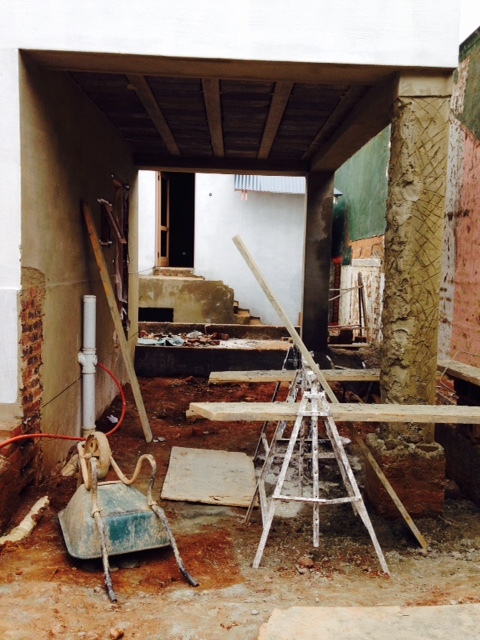 In the photo above, you can see the edge of the veranda relative to the street boundary wall. Both photographs are taken from East to West. I’m planning on growing climbers on the wall and doing paving interspersed with ground cover between the veranda edge and the wall. 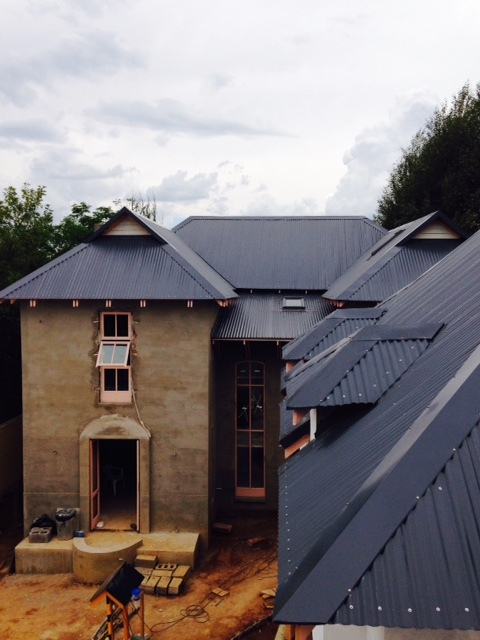 I’m very happy with the way the veranda roof has worked out. 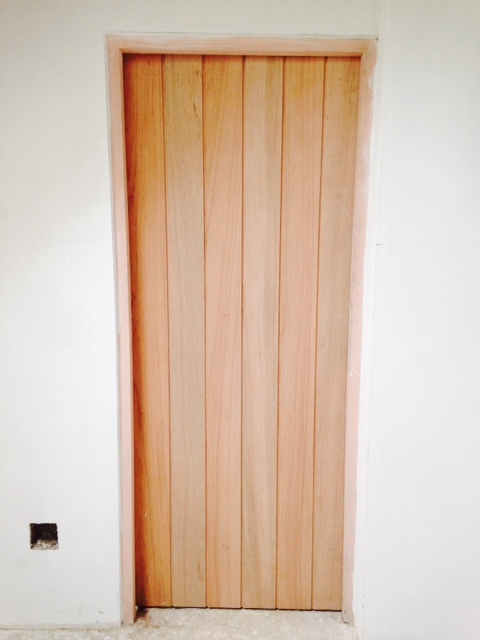 Internal door installed upstairs in cottage. 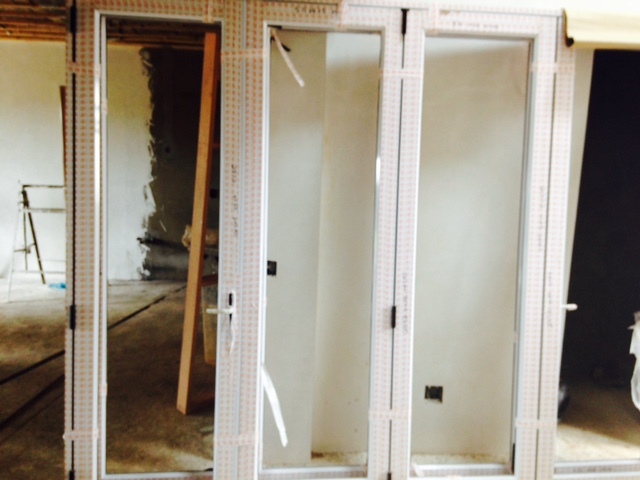 All the internal doors, throughout the house, guest suite and cottage are like the one above and will be painted white.